As you know I have very, very many talented friends and I just wanted to share with you some recent pics of their work that they have posted courtesy of their Facebook profiles – I do hope they don’t mind me sharing their skills with my blog readers. The first is my lovely friend Kat who as you know does medieval re-enactment and I have posted before about her costumes and her business Kat’s Hats . Well she also does Tudor re-enactment and these costumes are even more wonderful than her others due to the level of detail and complexity in them. 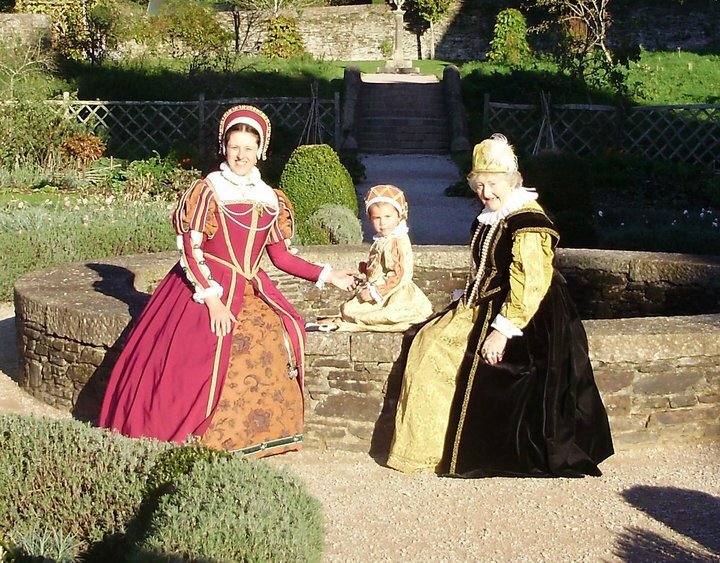 This pic was taken recently at an event at Buckland Abbey with her Tudor group. What amazes me about this pic is that it looks like a scene from the Tudors (love those series – have all on DVD) but all of these costumes were made by Kat. 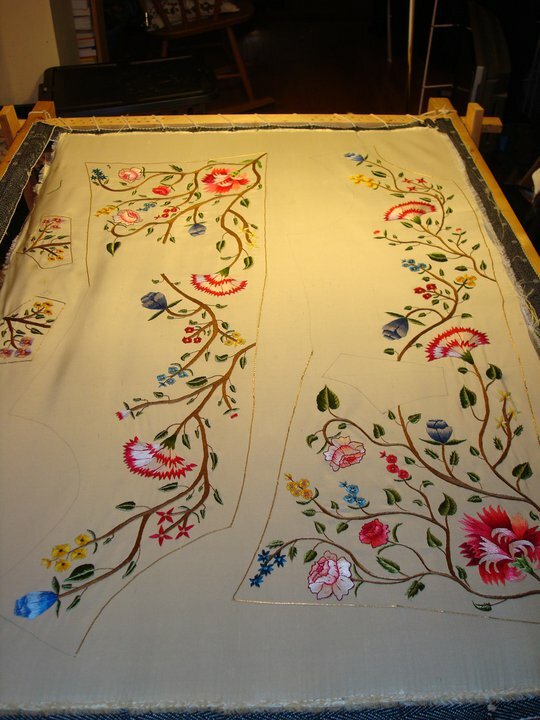 I have also mentioned Bucket before but have never had any really close up pics of his embroidery to show you. Bucket is one of the rare men who embroider and he along with Kat does many different periods of re-enactment. Bucket’s partner (also called Cat!) 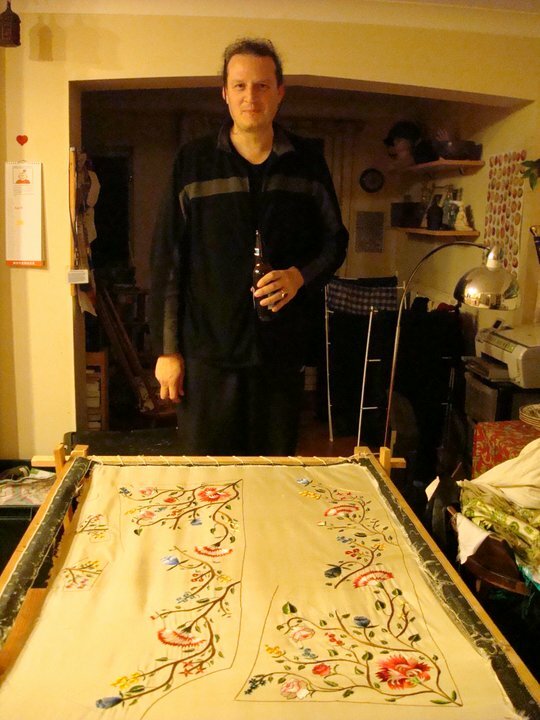 recently posted this on Facebook which is his work in progress on an 18th century waistcoat – up to the moment the work has taken 245 hours and counting! And here is the man himself with his work. Fantastic work both of you – I am honoured to know you. wow that waistcoat will be stunning!!! Those aren’t my costumes (sadly I wish I was that good) but are made by my friend Kat. The pictures from that event (at Buckland Abbey) are all wonderful – we are all very lucky to be able to do our re-enactment in such wonderful settings – I spend so much time camped at castles which is fab – and does make for great pics! That waistcoat is fantastic – whether it’s stitched by a man or a woman!! Many thanks for visiting my bog and leaving a comment – I thougt your name sounded familiar and when I looked on your blog I realised why. My daughter had a dolls’ house some years ago (she is now 19) and I bought one of your kits (for a footstool) and really enjoyed making it. I also made bedding and cushions etc – sadly no pics of anything as at the time I did not have a blog and did not obsessively photograph everything I made! Will enjoy reading more of your posts.